On a special night in which Champions League football returned to Liverpool after five years, this match produced the drama associated with the club’s exploits in Europe’s elite competition. The Reds fans would not have it any other way. In a competition in which Steven Gerrard has dragged them back from oblivion on so many occasions, it was fitting that he was the hero here. It was not on the same scale as Istanbul in 2005 or the match here against Olympiakos earlier in that campaign, but the Liverpool captain kept his cool from the penalty spot to earn his side all three points right at the death. The city has been hit by Champions League fever this month, with the Reds’ opener against Bulgarian side Ludogorets coinciding with the launch of the movie ‘One Night In Istanbul’ to commemorate that famous triumph nine years ago. Before the Champions League album blared out of the speaker system, Anfield roared You’ll Never Walk Alone with a gusto that suggested this could be one of those memorable European nights on Merseyside. But once the action got under way, Brendan Rodgers’ side fluffed their lines for long periods. They were slow to move the ball in possession and vulnerable to the counter-attack against visitors that they probably underestimated heading into the fixture. Far from the whipping boys, Ludogorets look like a team that will ensure a very competitive group completed by holders Real Madrid and Swiss side Basel. Liverpool will feel they should qualify for the knockout stage of the competition and while they didn’t exactly thrive under the pressure here, the result was all-important, especially in front of their own supporters. “It was a great night for everyone at the club, to play in the Champions League for the first time in five years, and to get the win was very important,” was the simple but to-the-point assessment of Rodgers. It was a special night, and they got the job done. Liverpool were well below par and still look like they are struggling for ideas in the final third without Luis Suarez, but they will improve as the competition and the season go on. Equally important for Rodgers will be the sight of Mario Balotelli scoring his first goal since his €20 million transfer to Anfield. The Italian’s work rate could not be faulted but until his 82nd minute strike he looked well short of sharpness in the Ludogorets penalty area, struggling to escape from defenders and seeing his best chance in the first half denied by a block from a defender. Yet when a real chance presented itself, he made no mistake, firing an unstoppable finish into the side netting. 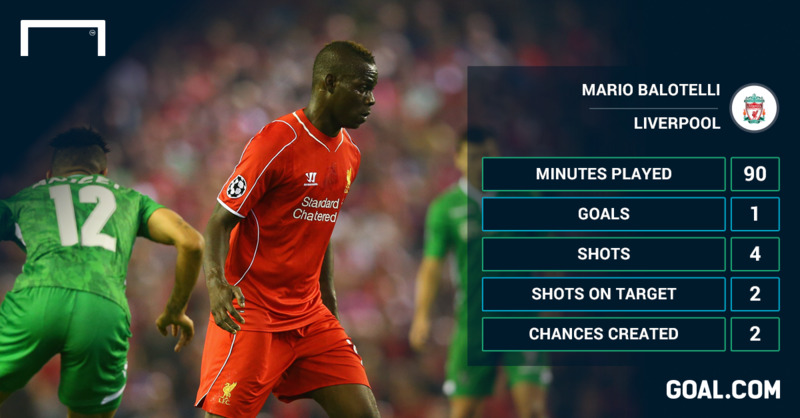 Like Gerrard, Balotelli has a sense of timing and occasion – and now he can start to relax in a Liverpool shirt. It was little surprise that Ludogorets equalised through Dani Abalo Paulos in the last minute of normal time given the visitors had constantly turned Liverpool’s defence and hit the post earlier in the half. Such casual defending will be ruthlessly punished if the Reds play in the same manner against Real Madrid at the Bernabeu on November 4. Then, in the 93rd minute, Javi Manquillo seized on a poor touch from Ludogorets goalkeeper Milan Borjan. Anfield erupted as though the ball had hit the net as the referee pointed to the spot. It might as well have been a goal. Gerrard doesn’t miss, he’s made for these occasions, the kind of which are littered in the history of this competition for the five-time European champions. And there will be more drama to come this season – it’s simply how they do it.